Number of Screen: 5 Nos. We are offering Vibro Pre Cleaner to our clients. This is a specialized closed body high capacity cleaners serving purpose as a one single machine in place of parallel and multiple machine which saves space, electricity giving superfine results in various grain industries. It removes papers, big stones & mud balls, husk straw, dust, sand, immature or weightless material from Grains.With double vibrating motors. With single drive for all operations. We offer Pre-Cleaners from Premium Engineers. - Furthermore it is also ideally suited to dress malting barley and milling grain to the highest quality commercial sample at a reduced throughput. 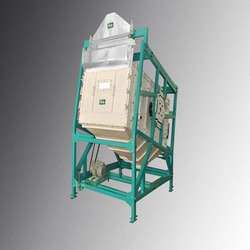 With the use of high grade material, we are engaged in offering a wide range of Paddy Pre Cleaner Machine. Designed under strict supervision of our experts, this Paddy Processing Machine is perfectly designed keeping all quality measures in mind. 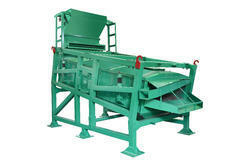 Paddy Processing Machine is available with us at good price range. As a prominent company, we are engaged in manufacturing and supplying a wide range of Paddy Pre Cleaner. - With inlet, with feed Roll, Pre-aspiration, Tail Aspiration & waste outlet on the right hand side. - With built on Fan, Drive & motors. Sun Foods Provides Pre Cleaning machine of class apart. Our machines can efficiently separate Oversized and Undersized impurities such as big rubbles and impurities, small impurities, sand, straw and foreign materials from food grains. The machine can also be used for grading different sizes of a product. We are dedicatedly involved in providing an excellent quality array of Paddy Pre Cleaner, for catering the various needs of our clients. Leveraging over the skills of our qualified team of professionals, we are engaged in providing Paddy Pre Cleaner. This Paddy Pre Cleaner is extensive used to remove the dust, gross, straws, mud lumps and little immature grains. Our product range is known for its hassle free performance and high durability.